Ever since I had a wardrobe make-over from Greet Moens some time ago (check this post) I have been wearing more colours and you know what… I kinda like it 🙂 And every time I go shopping, I try to stay away from black. So when I went on a daytrip to Ghent with my 2 sisters, my sister-in-law and a good friend, I was so glad to find this colour, funky skirt. I bought it at Juttu, a multi-brand conceptstore. 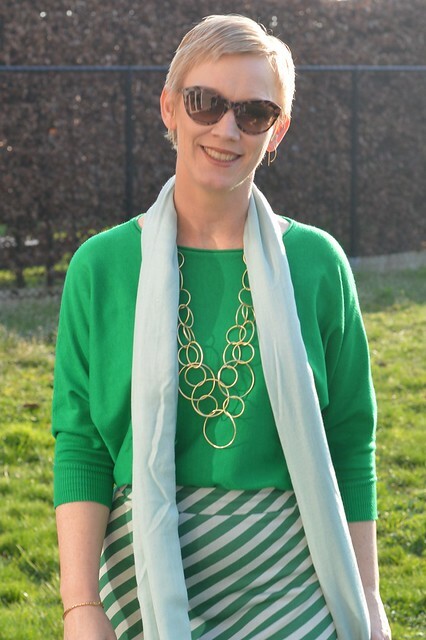 For today’s outfit, I am styling it with a grass green sweater I bought in England when on holiday there last summer. 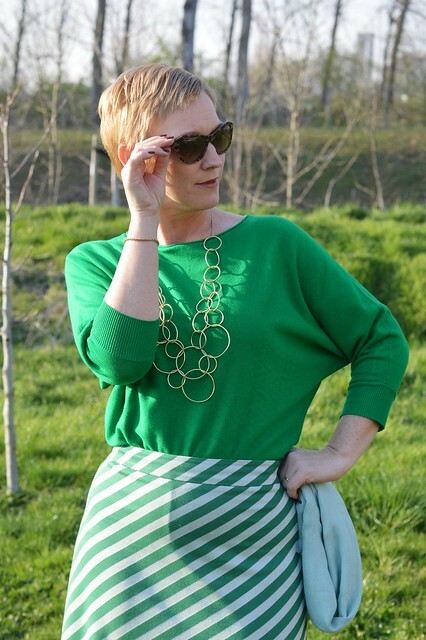 It complements the green of the stripes really well and it’s warm enough to wear on a bright and sunny spring day. The ankle boots I wear are a hand-me-down from a colleague (thanks Iris!) and they make the skirt more playful. 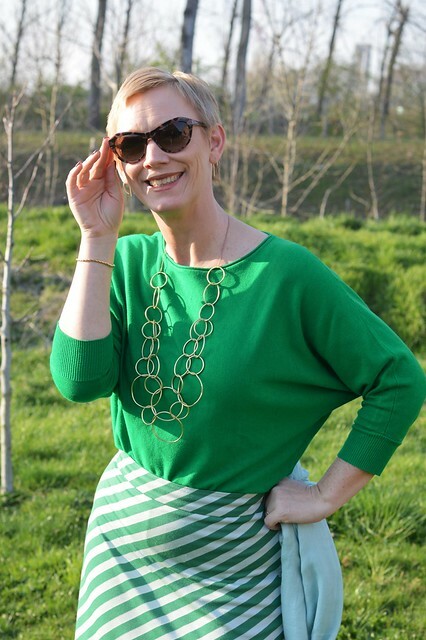 I am wearing my lovely necklace from Dansk Smykkekunst, my Max & Co sunglasses (don’t you just love the butterfly shape!) 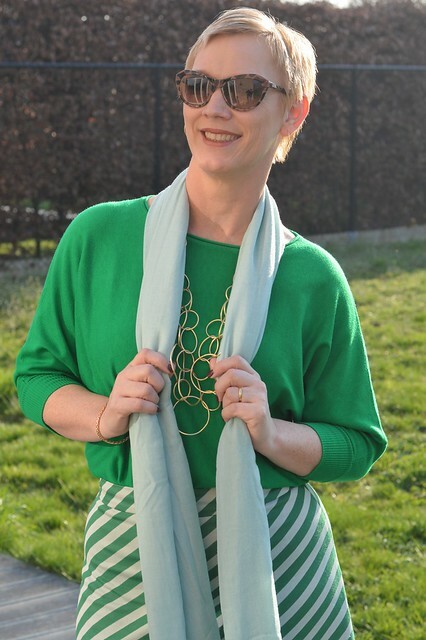 and a lovely mint-coloured scarf from JBC. Lovely colours! 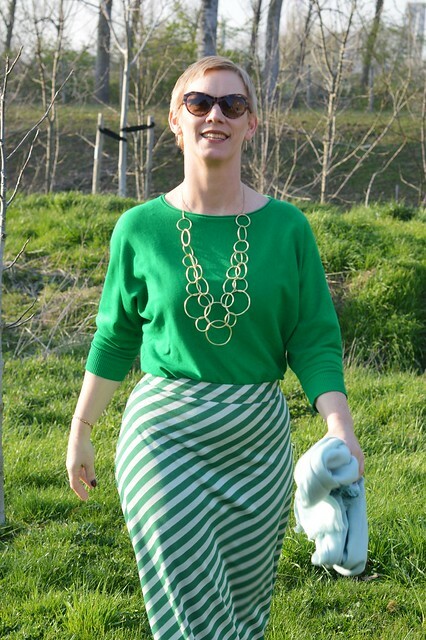 I love wearing green in this time of year. That is such a nice skirt by the way!